You know the scene in films where the nerd whips off his or her glasses and suddenly becomes the coolest kid at the prom? Well, that’s the Honda SH300i. 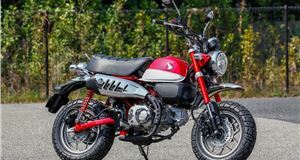 To look at, it would appear to be little more than a larger incarnation of the mainstay Vision that comes in 50- and 125cc models. Then you twist the throttle and Clarke Kent turns into Superman. 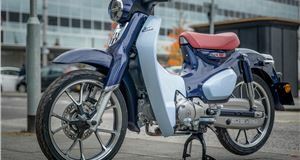 Okay, this 279cc scooter isn’t a superbike, but for this class it packs surprisingly swift performance. 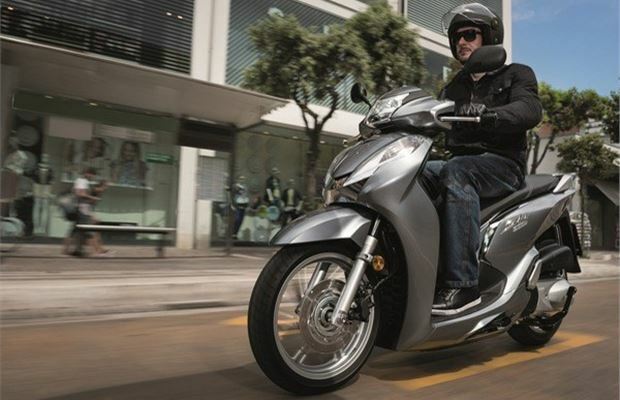 It’s not the most powerful or torquey in the midi-scooter sector, but the way it delivers its 25PS and 25.5Nm means you’re never left short-changed as you pull away from the lights. In fact, you may well give a few motorcycles pause for thought. So, it’s nippy in town, but the Honda has more to offer than that. As you pass the urban and national speed limits, the SH300i will continue to keep pace with traffic as you join the motorway, and there aren’t many scooters of this engine capacity that can claim that. At this sort of pace, the SH feels stable, though you will absolutely need the optional front screen to keep wind blast from beating on your chest. 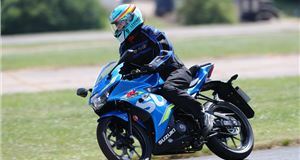 Some riders might also find the curiously canted forward riding position doesn’t initially inspire confidence when going quickly. However, you get used to it and we found the SH300i was perfectly comfortable over the longer distances it’s easily capable of travelling. You also get a 9.0-litre fuel tank that offers a range of around 180 miles thanks to a claimed 94.0mpg. In the real world, reckon on around 150 miles between fills. 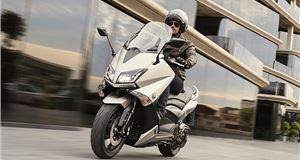 Aside from the engine and twist-and-go transmission making this Honda so simple to use, there are also the large 16-inch wheels. They may look a bit gawky when the SH is parked up, but once you’re in the saddle you can’t see them, but, boy, can you feel their effect. Their bigger diameter means they waft over potholes that smaller wheels dip and crash into, so the Honda makes much smoother progress. In turn, that makes going further on this scooter much easier on your backside. Talking of derrieres, the SH’s saddle provides ample space and comfort for the rider and the stepped shape gives your lower back something to rest against on lengthier trips. The pillion is equally well looked after and gets foot pegs for added security. The only downside here is the seat height means any rider who has a shorter inside leg measurement is going to struggle to get one foot flat on the ground never mind both. Still, at least the traditional step-thru design with flat foot board makes it easy to slide off the seat when you need to support the scooter at a standstill. Back on the road, the SH handles superbly regardless of speed. In town, it ducks and weaves through bottle-necked traffic and the disc brakes bring it all to a quick, control halt whenever it’s necessary. 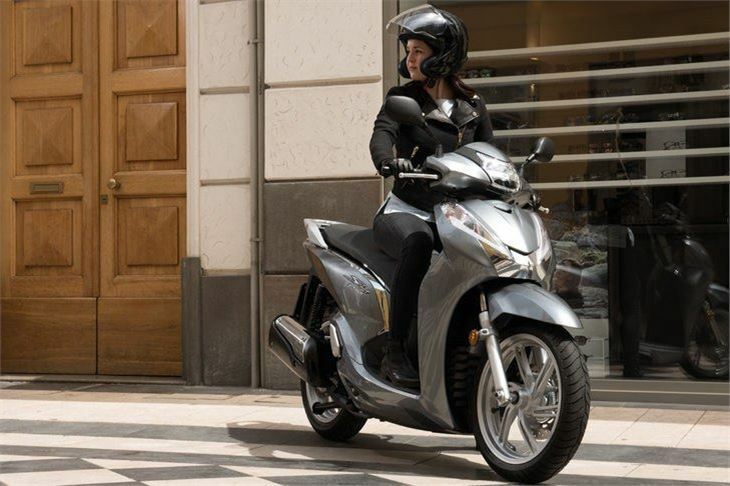 With the back-up of ABS, even wet city streets hold no fear for this Honda’s rider. Head onto freer flowing routes and the SH300i shows off another of its hidden depths in the way it handles. 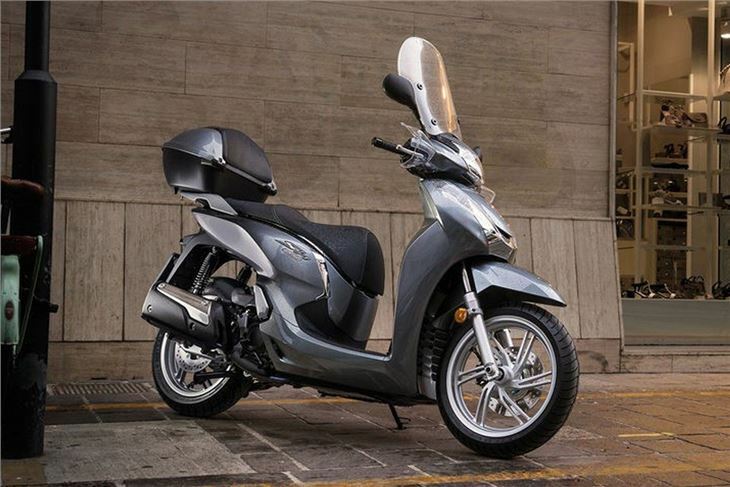 The looks might say plain commuter scooter, but from the saddle you can hustle it along in fine style. It’s balanced, agile and the standard tyres offer up more than sufficient grip to keep you entertained on the long way home. All of this praise for the SH makes it all the more frustrating when you discover its few flaws. Prime among these is the paucity of storage space. There’s a glovebox in the front leg guard, but the real disappointment is the underseat cubby. It’s not big enough for a full-face helmet and you’ll be pushed to pack in waterproofs along with an open-face lid. As a result, an optional top box becomes essential on the SH300i. Then we come to Honda’s Smart Key ignition system. The idea is it works like a car’s keyless ignition, where you just walk up, open the door and press a button to fire up the engine. With the SH, you have to press the fob’s button, turn the ignition dial on the bike, wait for it check everything’s okay and then you start the engine. Switching off is just as much of a palaver and you have to be careful to make sure it’s full turned off to avoid the risk of leaving your scooter unsecured. Surely a straightforward key in an ignition barrel is a better solution? With practice, you learn to use the Smart Key, but it’s a layer of faffing we could do without. 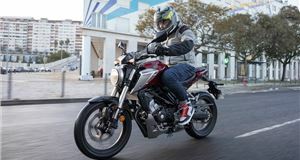 It’s a negative that irritates every time you use the Honda, which is otherwise an excellent everyday choice that turns your commute from humdrum into hero. Top speed 90mph (est). Fuel consumption 94mpg (claimed). VED £41.